More than one million retirees enrolled in multiemployer pension plans are in danger of losing benefits because the plans that pay them will go insolvent. In addition, the federal agency that acts as a safety net — the Pension Benefit Guaranty Corporation (PBGC) — is also in danger of insolvency. Unless something is done to address this crisis, there will be billions lost in retirement benefits. In 2014, Congress passed what it believed was a solution in the form of the Multiemployer Pension Reform Act (MPRA). The Act was designed to provide trustees with a solvency restoration tool and to protect retirees from the larger benefit reductions they would see should their plan go insolvent and the PBGC would have to guarantee payments. The MPRA however, still allows for drastic cuts to participant benefits, and is, of course, opposed by current workers and retirees whose payments would be slashed under the terms of the MPRA. Since its passing, several unsuccessful efforts have been made to repeal MPRA and replace the MPRA with legislation that would better protect pensioners and help ailing plans return to solvency. The most recent attempt was the Butch Lewis Act, introduced by Senator Sherrod Brown (D-OH). Named for retired Teamster’s Local 100 President that died while fighting to protect retiree benefits, the legislation would have created a new federal loan program available to struggling multiemployer pension funds. While Brown sought to have the bill included in the budget bill passed in February, it did not make it into that legislation. Brown did however secure the creation of a bipartisan House and Senate Joint Select Committee on multiemployer pensions in the budget deal. The Committee, made up of eight Democrats and eight Republicans from both Houses of Congress, will meet on at least five occasions to discuss solutions to the pension crisis. “While it is not the immediate solution we hoped for, this committee will force Congress to finally treat the pension crisis with the seriousness and urgency American workers deserve,” Senator Brown said in a statement. 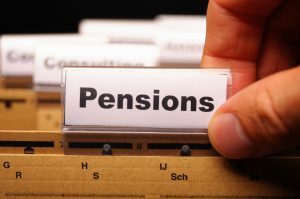 The committee’s assignment is to produce a bill to solve the pension crisis by the final week of November, Senator Brown said in a statement. If at least four members from each party agree on a compromise, that solution will be guaranteed the expedited votes in the House and Senate, with no amendments.